The Auditorium Theatre invites members of the press to attend both the Wednesday, March 6 and the Thursday, March 7 performances of Alvin Ailey American Dance Theater. Please submit your requests to Lily Oberman by email at loberman01@auditoriumtheatre.org or by phone at 312.341.2331. (CHICAGO, IL) Alvin Ailey American Dance Theater returns to Chicago March 6-10, commemorating the company’s 60th anniversary and the 50th anniversary of its first performances at the Auditorium, its Chicago home. During these special engagements, Ailey gives Midwest premieres to Rennie Harris’ Lazarus, the company’s first ever two-act ballet; Wayne McGregor’s Kairos; and Jessica Lang’s EN. The company also performs the Timeless Ailey program, a curated selection of classic pieces by company founder and visionary Alvin Ailey. “The Auditorium Theatre is honored to be the Chicago home for Alvin Ailey American Dance Theater since 1969, and we are excited to celebrate our longstanding partnership with three incredible programs that represent the past, present, and future of this legendary company,” says C.J. Dillon, Auditorium Theatre Chief Programming Officer. Lazarus, choreographed by the renowned hip-hop choreographer Rennie Harris and co-commissioned by the Auditorium Theatre, is inspired by the life and legacy of Ailey himself. Lazarus powerfully addresses the racial inequalities that America faced when the company was founded in 1958 and still faces today. Lazarus is set to original music by composer Darrin Ross, “Feeling Good” by Nina Simone, “As Yet Untitled” by Terence Trent D’Arby, “Black Man in a White World” by Michael Kiwanuka, “Glory, Glory” by Odetta, audio recordings of Ailey, and additional spoken word texts. Harris, recently named the inaugural artist-in-residence for Ailey, is the founder of Rennie Harris Puremovement and the recipient of a Pew Charitable Trust Choreographer Initiative Fellowship, a Guggenheim Fellowship, and a Dance Magazine award. 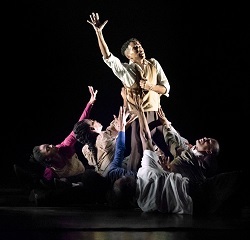 His previous works for Ailey include Love Stories, Judith Jamison’s dynamic collaboration with Harris and Robert Battle (2004); Home (2011); and Exodus (2015). Learn more about the creation of Lazarus here. 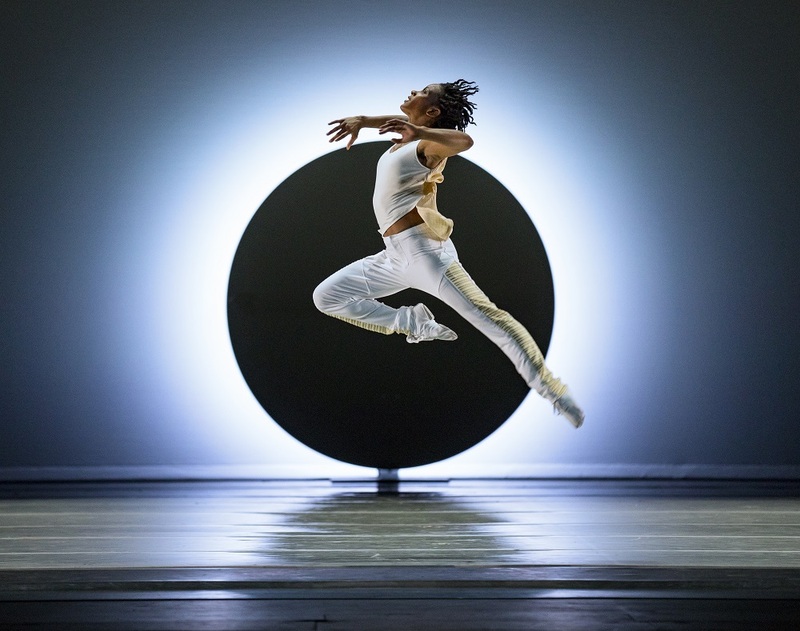 Ailey is the first American company to stage British choreographer Wayne McGregor’s Kairos, created in 2014 and set on the Ailey company in 2018. Kairos (a word which means both “the most opportune time to take action” and “weather”) is an angular, synchronistic ballet set to experimental composer Max Richter’s reimagined version of Vivaldi’s The Four Seasons. McGregor is the resident choreographer for The Royal Ballet and has created works for companies including Paris Opera Ballet, New York City Ballet, Nederlands Dans Theatre, and more. The Ailey company previously worked with McGregor to stage his work Chroma (2013), which made its Chicago premiere at the Auditorium in 2014. EN, New York choreographer Jessica Lang’s first work for Ailey, is a celebratory ensemble work set to original music by composer Jakub Ciupinski. The title for the piece has multiple meanings in Japanese, signifying circle, destiny, fate, and karma. According to Lang, the work “reflects on the universal experience of coming full circle and, as time passes, we recognize the people we meet along life’s journey who play a part in the fate and destiny of our lives.” Lang is the Artistic Director of Jessica Lang Dance and has created 100 original works, including for American Ballet Theatre, Pacific Northwest Ballet, the National Ballet of Japan. She is married to Ailey dancer Kanji Segawa, who served as assistant to the choreographer for the creation of EN. 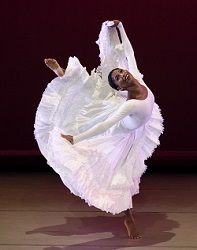 The Timeless Ailey program brings together over a dozen treasures from Alvin Ailey’s rich body of work, including excerpts from lesser-seen pieces like Mary Lou’s Mass (1971), Ailey’s collaboration with “Queen of Jazz” Mary Lou Williams, and The Lark Ascending (1972), set to music by Ralph Vaughan Williams. Other pieces highlighted in Timeless Ailey are Blues Suite (1958), Streams (1970), Hidden Rites (1973), Night Creature (1974), Cry (1971), Phases (1980), Opus McShann (1986), Pas de Duke (1976), For Bird – With Love (1984), Love Songs (1972), and Memoria (1979). Since its creation in 1960, Revelations has consistently enraptured audiences all over the world with its perfect blend of reverent grace and spiritual elation. Alvin Ailey’s signature masterpiece pays homage to and reflects the cultural heritage of the African American, which Ailey considered one of America’s richest treasures – “sometimes sorrowful, sometimes jubilant, but always hopeful.” Choreographed when he was only 29 years old, Revelations is an intimate reflection inspired by childhood memories of attending services at Mount Olive Baptist Church in Texas, and by the work of writers James Baldwin and Langston Hughes. Set to a suite of traditional spirituals, Revelations explores the emotional spectrum of the human condition, from the deepest of grief to the holiest joy. A classic tribute to the resolve and determination of a people, the ballet has been seen by more people around the world than any other modern work. Alvin Ailey American Dance Theater inspires all in a universal celebration of the human spirit using the African-American cultural experience and the American modern dance tradition. 60 years after its founding, Ailey continues to move forward under the leadership of Robert Battle, revealing time and again why Alvin Ailey American Dance Theater is one of the world’s most beloved dance companies. Visit AlvinAiley.org or AuditoriumTheatre.org for further information. The presentation of Alvin Ailey American Dance Theater was made possible by the New England Foundation for the Arts’ National Dance Project, with lead funding from the Doris Duke Charitable Foundation and The Andrew W. Mellon Foundation. This presentation is supported by the Arts Midwest Touring Fund, a program of Arts Midwest that is funded by the National Endowment for the Arts, with additional contributions from Illinois Arts Council and the Crane Group. Tickets start at $34 and are available online at AuditoriumTheatre.org, by phone at 312.341.2300, or in person at the Auditorium Theatre Box Office (50 E Ida B Wells Dr). Alvin Ailey American Dance Theater is part of the International Dance Series (which also includes American Ballet Theatre and Eifman Ballet of St. Petersburg), which offers a 25% discount on tickets. The Auditorium Theatre offers $15 student rush tickets to full-time college students and $5 to young people ages 13-19 with Urban Gateways’ Teen Arts Pass program throughout the Ailey engagement. Tickets must be picked up at Will Call with a valid ID. The Auditorium Theatre’s ADMIT ONE program, launched in 2016, offers complimentary tickets to Chicago-area community groups. Community groups may apply for ADMIT ONE here. Special Events – For more information or to purchase tickets to these events, please visit theaud.us/aileyevents. Celebrate Ailey’s 60th anniversary and its 50th anniversary performing at the Auditorium Theatre at the post-performance Celebrating Ailey Soirée with Ailey artistic director Robert Battle and members of the Ailey company, hosted at Venue Six10. The event includes cocktails, a buffet supper, and music provided by a DJ. All proceeds from the Celebrating Ailey Soirée benefit the Auditorium’s presentation of the Ailey company in Chicago. Tickets to the Celebrating Ailey Soirée, which include a seat to the opening night performance, start at $350 and may be purchased online here. For tables, please contact Kelly Saroff Allen by phone at 312.341.2364 or by email at ksaroff@auditoriumtheatre.org. Ailey performing artists teach choreography from Ailey’s masterpiece Revelations to dancers of all levels in this community workshop, which takes place from 5:30-6:30PM at Roosevelt University’s Goodman Center (501 S Wabash Ave). Registration is required for this event. The Auditorium Theatre hosts a special College Night on Thursday, March 7. College Night tickets are $25 and include a seat to the performance and a pre-show pizza party. Alvin Ailey American Dance Theater performs a special one-hour Student Matinee performance for students in grades K-12 on Friday, March 8. Discounted tickets to Alvin Ailey American Dance Theater are available for groups of 10 or more people. Groups that purchase tickets to the Friday, March 8 performance are invited to a pre-show workshop with an Ailey artist. Group tickets may be purchased by phone at 312.341.2300 or reserved online here. The Auditorium Theatre hosts a special Young Professionals’ Night on Thursday, March 7. Young Professionals tickets are $50 and include a seat to the performance and a pre-show party with light bites and drinks. The Auditorium Theatre offers two 90-minute Dance Master Classes with artists from Alvin Ailey in the Katten-Landau Studio (425 S Wabash, 4th Floor). Master Classes are free and open to intermediate and advanced dancers. Registration is required for Master Classes. Auditorium Theatre Creative Engagement staff hosts a Q&A with performers and artistic staff from the company. The post-show Q&A is open to anyone with a ticket to the March 9 performance.